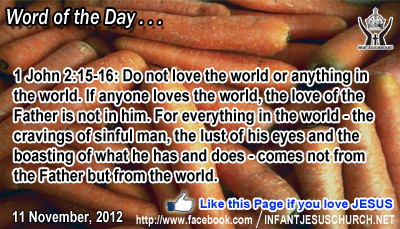 1 John 2:15-16: Do not love the world or anything in the world. If anyone loves the world, the love of the Father is not in him. For everything in the world - the cravings of sinful man, the lust of his eyes and the boasting of what he has and does - comes not from the Father but from the world. Heavenly Father, Give us wisdom, to invest in you and things that matter. We confess to you that our eyes and our heart are often distracted by the flashy stuff that is momentary. By your Holy Spirit, Heavenly Father, stir our heart to yearn for you. In the precious name of Infant Jesus we pray. Amen. Love doesn't calculate; it spends plentifully! Jesus drove this point home to his disciples while sitting in the temple and watching people offering their tithes. Jesus admired a poor widow who gave the smallest of coins in disparity with the rich who gave larger sums. How can someone in scarcity give more than someone who has ample means? Jesus' response is very simple: love is more valuable than gold! Jesus taught that real generous must come from the heart. A gift that is given with a bitterness or for show loses most of its value. But a gift given out of love, with a spirit of kindness and sacrifice, is invaluable. The amount or size of the reward doesn't matter as much as the cost to the giver. The poor widow could have kept one of her coins, but in its place she carelessly gave away all she had! Jesus praised someone who gave hardly a penny - how unimportant a sum - because it was everything she had, her entire living. What we have to offer may look very small and not value much, but if we put all we have at the Lord's removal, no matter how unimportant it may seem, then God can do with it and with us what is ahead of our reckoning. Do we know the joy and freedom of giving generously to God and to neighbor with gratitude and love? Loving Infant Jesus, all that we have is yours. Take our life, our possessions, our time and all that we have and use them as you desire for your glory.